Artists are not generally encouraged to attend art fairs, the majority of which exist primarily to facilitate sales between collectors and dealers who converge for a frenzy of negotiation. And most artists I know don't enjoy them, complaining that there is so much work you can't focus on anything, or that the marketplace bustle is singularly unsuited for the serious viewing and contemplation of art. However, I relish art fair week and see as much as I can. I savor the efficiency of being able to see pieces from all over the world within a few short days. I've taken my share of slow weekend subway rides to Bushwick to see something entirely underwhelming, and waited countless hours for antiquated, creaky, manually-operated elevators in Chelsea only to witness a brand new show of works virtually indistinguishable from those produced by the same artist two years ago. So for me it's pure bliss to stroll from Mexico City to Seoul, on to Paris, under one roof. If the work doesn't grab me, I walk on by, having lost a mere few seconds. The real payoff inevitably comes when in spite of the visual din of surrounding works, the crowds, and the fatigue, something you would not have seen otherwise speaks to you. You might remember only one or two pieces from all of the art fairs, but they will stick with you forever. I first encountered one of my favorite artists (who is not represented in New York) at an art fair. What perturbs me about the art fairs is the lack of new media art - some art fairs exhibit a smattering, others none at all. Are there really so few notable practicing new media artists? It's probably harder to sell new media than more traditional forms (e.g., paintings and prints). Installing new media works is almost always more difficult and possibly harder to ship - most of the new media shown was by New York galleries; perhaps having the artist nearby to make sure the piece was functioning correctly was a consideration. A friend speculated that new media is to art what poetry is to publishing; in a down market, the new Dr. Phil book will be printed, but esoteric works won't be considered. Following is a brief summary of my experience as a hunter of new media art this past weekend. Interactive - but new media or old media? My first stop Thursday was Independent. The stairwells were all lit up, but it was a tease. Although a lot of the work relied on new technological processes for fabrication, I'm not sure I saw a single instance of new media art. One could argue that Jordan Wolfson's "Con Leche" computer animation shown by Johann Koenig fits the bill. Does any linear, looping video count as "new media" in 2010? The Chapuisat brothers' interactive neon piece "The Ambition of an Idea Number One" shown by Mitterand + Sanz is low tech - can new media be low tech? Independent made me realize that the boundaries of what can be considered new media are blurry indeed. For the rest of the art fairs, I focussed on work which relies on computer processing while it is being shown. 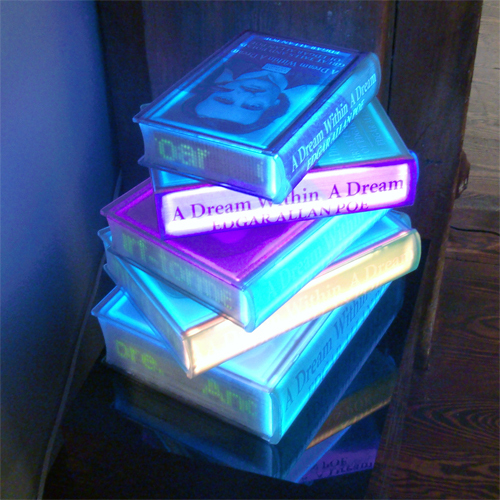 Detail of Airan Kang's "One Life, Some Books." The nearby Korean Art Show had a few pieces (notably Airan Kang's "One Life, Some Books" shown by Gallery Simon) which were either new media or almost new media, displayed prominently just through the doors as you entered the fair. Supporting the "it's tough to install" hypothesis, Kang is based in New York, in contrast to the majority of the other artists, predominately based in Korea. Seduced and ensnared? Bound to a predetermined fate, lacking free will? At Verge (held in a hotel), I saw a closed door, which said simply "Project Space." I wondered, "Could there be new media behind that door?" Curious, I opened it and went in. An oddly compelling robot was lying on the floor, tethered to a weird contraption which was apparently a paper-roll reader. More visitors entered the room (even though I had closed the door behind me), and boldly switched on the contraption. I don't know if the robot was supposed to dance and the piece wasn't functioning correctly, or if the robot was supposed to lie on the floor feebly twitching and clicking, but I was very excited to see it. I think we were all quite moved. This is one of the experiences I will remember, the high point of art fair weekend for me. It felt like poetry, as if a Titan had been struck down by Zeus (or a Terminator had fallen in love with a sadistic harpy player piano which tragically enslaved it by musical seduction). Checking the program, I learned the piece was by Jonathan Schipper, exhibited by Pierogi. In the lobby as I was leaving I noticed the massive new media installation Artists Meeting Art Machine. I bought a token, the machine spat out a small drawing, and I headed home with my first ever art fair acquisition. Bill Smith explains his standout "Magnetically stabilized, air driven, computer interfaced, chaotic emu egg pendulum"
Friday I started off at Pulse, where I saw the most new media of all the art fairs. 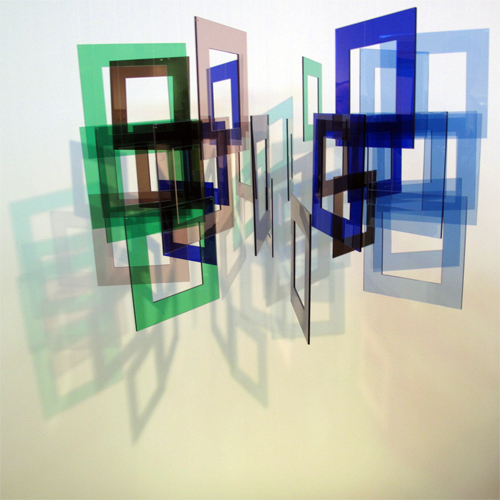 I remember seeing Leo Villareal's "Solaris" (Connor Contemporary) in several other art fairs. Rafael Lozano-Hemmer's "The Company of Colours" at Bitforms taught me I'm pinker than I knew. J Shih Chieh Huang's small hanging pieces at Virgil de Voldere made me want to revisit his larger jellyfish currently on view at the gallery. Stephan Reusse's laser choreography "Merci Dominique" mesmerized my friend. (If you use a laser, does that make it new media?) New media pioneer Jim Campbell's "Reconstruction #9 [Ganges]" mesmerized me. 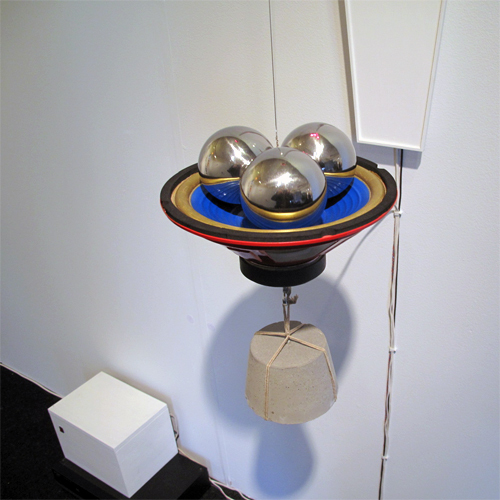 However, Bill Smith's "Magnetically stabilized, air driven, computer interfaced, chaotic emu egg pendulum" presented by PPOW was the second piece I'll remember for sure. The egg would tilt periodically, hitting a rod, which would trigger the computer to draw a line in the direction the egg had fallen. 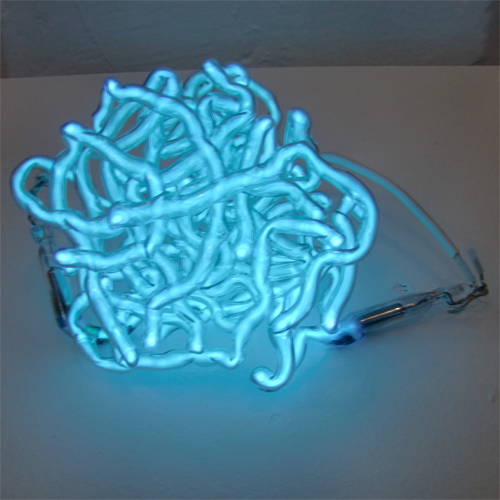 It's a moving sculpture and a dynamic drawing machine at the same time, integrating physical and digital elements. I enjoyed the sensation of suspense while waiting for the egg to tilt. At Pool (also held in a hotel), I don't think I saw any new media. I did see one computer in a shower, but couldn't figure out if it was software-driven or just showing a video, and it was too crowded and noisy for me to ask. I also don't think I saw any new media at Fountain, although Michael Guajardo's laser sculptures popped out of a visually overcrowded environment, and Allison Berkoy's large installations were both fun and creepy. I never get tired of looking at MARCK's wife taking a bath. Saturday I reencountered MARCK's awesome "Frauenkiste" at Lichtfeld, and enjoyed "Voices IV" by Daniel Glaser / Magdalena Kunz at Gagliardi Art System as well as Ryan Brennan's "cinemallages" at Jackie Paper. However I think all of this work, too, falls into the category of video installation, not new media per se. Difficult to capture the poetic smoothness of this piece by Elias Crespin in a photo or in a hand-held video clip. Usually the crowds at the Armory make it tough for me to enjoy. However I was excited by Elias Crespin's simple and beautiful "Tetralineados Circular" at Cecilia de Torres. He uses his iPhone to program the behavior of the sixty-four independent motors. I also enjoyed judoN and K Staelin's "Compost" (which I have a personal connection to - they created and showed the work as part of the "Spring Planting" project I instigated last year). Saturday evening I left the art fairs, heading first to a Synthetic Zero group show at BronxArtSpace where I'm showing my new media installation "Summer Shade," then to Climate/Gallery in Long Island City where I'm jurying a group show. I've never seen so many harmonicas (courtesy of Being Beings, in town from Chicago for the weekend). Sunday my first stop was Volta, where Douglas Henderson's "Flash Gordon" integrated sculpture and sound with dynamic laser drawings at Berlin's Galerie Mario Mazzoli. Samuel Rousseau's tiny software-driven people paced inside their pills at Aeroplastics Contemporary. Volta is the only fair which restricts each gallery to exhibiting a single artist, making it feel more like a museum experience than an art fair experience. I enjoyed Volta so much I returned later in the day for a second look. At Red Dot, the only new media were interactive, mechanical sculpture by Joel Hobbie and live-feed video pieces by Greg Chaprnka, both shown by Eileen Braziel Fine Art. Arriving at Dutch Art Now, I wondered if the fair's title had been mistranslated. Dutch Painting Now would make more sense. I can't believe that no new media artmaking goes on in the Netherlands. I hope the organizers made it over to the Korean Art Show. 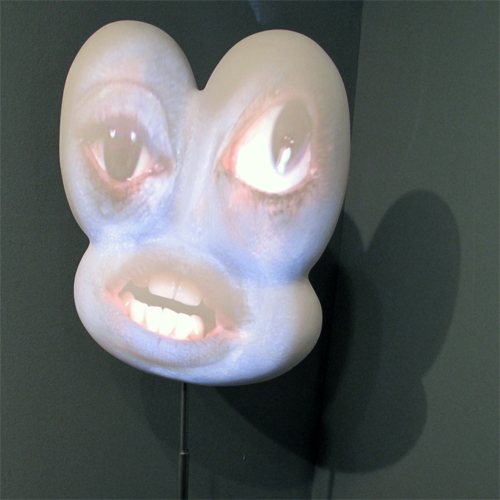 My last stop was the ADAA, where you wouldn't expect to find any new media (I was holding onto a faint hope of seeing some Nam June Paik), I encountered a single Tony Oursler piece. Oursler was shown at several of the fairs. However, I thought that it was interesting to see PPOW, exhibitor of the unusual emu egg thing in Pulse, showing a completely different personality. 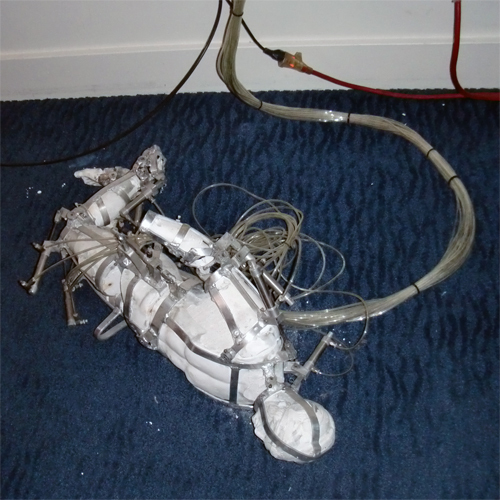 Two weeks later, I remember a clicking, twitching, tethered robot collapsed on the floor of a hotel room, and wonder, would it be possible to convey the sensation I felt viewing that piece through painting? I don't think so. I think the strongest new media at the art fairs argues strongly that we need to see more new media next year, that when artists engage with technology, the results move us in ways the most contemporary old media does not. I hope to see more new media next year. 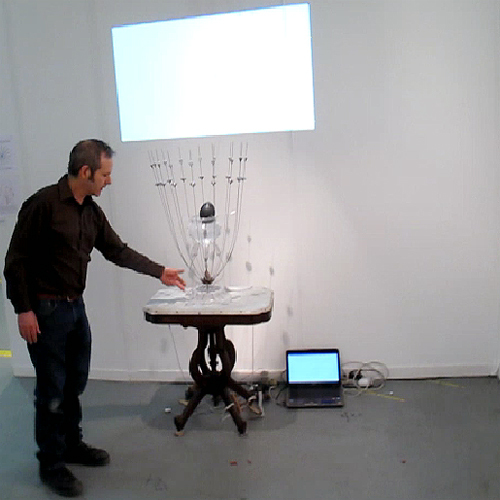 some new media at the 2010 nyc art fairs from erik sanner on Vimeo. More images of what I saw here (on Flickr).